Are cobots too safe? Are cobots safe enough? Our experts can’t seem to agree. Here’s how safety levels are decided for collaborative robots. When you perform a good risk assessment, you can be sure that your application will not injure or harm people. There was a little disagreement between the experts at our 2018 Robotiq User Conference (RUC). Esben Østergaard of Universal Robots thought that the current safety limits were “super-conservative, bordering on the ridiculous.” On the other hand, Jeff Burnstein from A3 was keen to draw attention to the point that cobots are not inherently safe and told a story of when a (supposedly safe) cobot almost broke his hand. 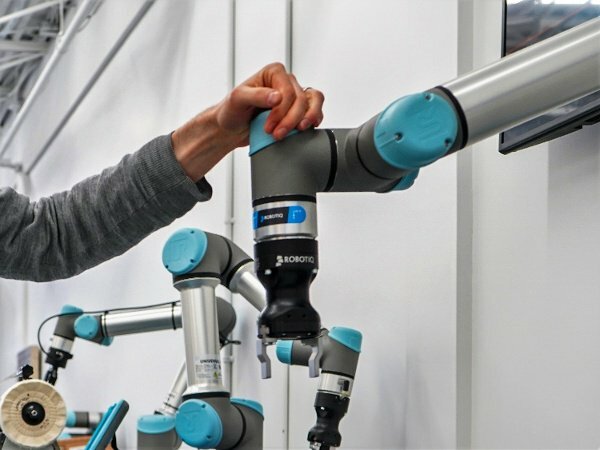 Are cobots too safe or are they not safe enough? It’s a difficult question with no clear answer. But, we can shed some light on the issue by looking at how cobot safety levels are defined. Where are cobot safety levels defined? Probably the most widely recognized source of safety levels for cobots is the ISO/TS 15066. This is a technical report produced by the International Organization for Standardization (ISO). ISO defines standards for almost everything, from the size of general purpose screws (ISO 68) to the microbiology of animal foodstuffs (ISO 21567:2004). My favorite standard (and probably other people’s as well) is ISO 3103, which defines the standard process for making a cup of tea. ISO/TS 15066 (Robots and robotic devices — Collaborative robots) is not actually a standard yet. It is a technical specification (hence the TS). This means that more technical development is required before it is turned into a full standard. You can find out all about the standard in our eBook ISO/TS 15066 Explained. Who decides cobot safety levels? The safety levels defined in the standard specify the maximum force that a cobot can apply when it collides with a human. As we discovered during the RUC, people have different opinions about what constitutes a safe limit. That’s why there are a variety of people in the standard’s technical committee. All standards are produced by a technical committee (TC). The cobot standard is produced by ISO/TC 299 (Robotics). The current chairperson of this committee is Staffan Elfving from ABB robotics and the current secretary is Katarina Widström from the Swedish Standards Institute. The members participating in this committee come from 27 ISO member states, largely from North America, Europe, Australia, and South-East Asia. Any stakeholder with a significant interest in a particular standard can get involved with its development. To do so, you have to get involved via the standards organization in your country which is a member of ISO (which can be found on this list). All standards go through a defined sequence of steps. ISO/TS 15066 is still undergoing this process.